A pilgrimage to Ikea is unsanctified without a trip to Wing Yip for a foodster fix. Croydon’s oriental alimentary emporium has really been snazzing itself up lately; witness the snappy slogan for a start – I love it. It’s also all smart uniforms and smiles nowadays – nothing wrong with that; in the time of inscrutable scowling I used to feel like an interloper adrift – just so long as they stop short of employing greeters at the door, I’m a happy punter. Marketing pundits advocate aerosoling the scent of bread baking to foster a super-duper supermarket experience but that ruse is getting pretty tired; we’ve all cottoned on to their cotton-wool loaves. Wing Yip has come up with something much more evocative: the stinky sock stench of durian filled our nostrils the second we breached the threshold. Yummy – seriously. I can’t decide which part of this freaky fruit is my favourite – the foetid aroma, the weird succulent flesh or its viciously spiky carapace: don’t ever try to carry one home in your arms, it will hurt you. Anyway, at £5.95 a kilo and not one weighing less than three we regretfully declined this time. My hunt for durian flavoured wafers continues, however. I opened a pack once at work in Vancouver and next thing I knew they’d evacuated the building, convinced of a gas leak. Try this if you’re not keen on your job, but if you do please let me know where you got the biscuits. and for 84p Anya Hindmarch can eat my shorts. 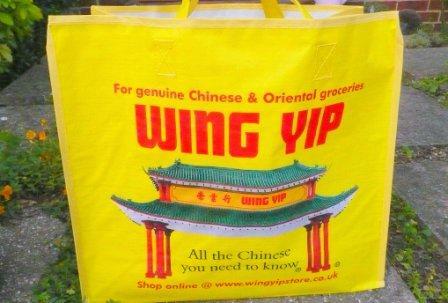 I haven’t been to Wing Yip since they brought these snazzy new bags in, I must return! I love the dim sum restaurant upstairs. Ooooh! and it’s in GBP!! thanks for the tip Emily. I’m on a diet at the mo’ (my winter layer) but I wonder if I could sneak in the 700g tin without my street getting cordoned off….